Not since that “cloaca” email shortly after I revealed my identity has a comment from a pigeon lover had me this ROTFLMAO. 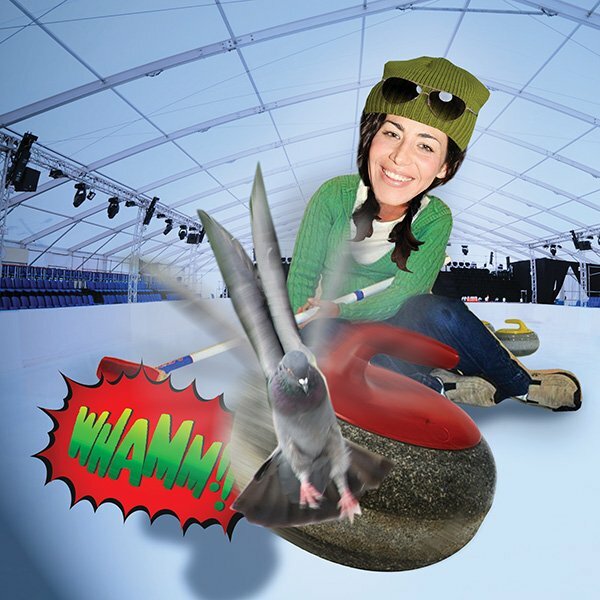 The Curling Queen photo – hitting a pigeon with the stone – is just what the OLYMPICS needs to DESTROY its image! Let’s all NOT cheer when we see self-centered self-serving athletes hurting wildlife for fun, or for some stupid picture – which might show just how shallow and inane-minded some of these athletes REALLY ARE! This says a lot about what the Olympics has devolved into – promoting animal abuse and idiocy in its athletes. The Pittsburgh Magazine – for publishing this kind of trash photography – CONDEMNS itself in the minds of the millions who don’t take abuse of animals as a joke. SHAME ON YOU PITTSBURGH MAGAZINE! 2. This reader apparently has never heard of Photoshop and believes that we actually took a physical flesh and doom pigeon and had me aim a 40 lb. stone at it over and over again until BLAMMO! I wish! 3. I have no control or say in the illustrations the magazine places with my writing. I never asked that a pigeon be included each month. The mag and its illustrators just do that all on their own ’cause they’re awesome like that. 4. “promoting animal abuse and idiocy in its athletes.” Again, I’m just giddy she/he thinks I’m an actual Olympian. I could get used to this. I’m starting to get a big head about it. I’m going to start requesting that the Olympic theme be blasted everywhere I go to announce my arrival, and then I’ll make my grand entrance, pull a pigeon out of my pocket, toss it in the air and shoot it out of the sky with a stun gun to coincide with the crescendo of the music. Maybe that crazy reader is also a member of the NY Bar? They’re apparently upset that people are kidnapping pigeons in New York City. Oy. I say please take them! Maybe they could take them and unleash them in the Flyers locker room? this person needs to exit from society and stay indoors watching “New Zoo Review” reruns. Doug was a pimp yo. Photoshop? I thought that if I hit a pigeon hard enough, the word “Whamm!! !” would appear above them. I haven’t been this disappointed since I punched a guy after seeing Batman on TV and the word “Zonk!” didn’t appear. Every four years you should go bankrupt a new city somewhere in the world. Of course, you’ll need a stupid looking mascot. Some people need to get a life. The person who wrote that comment is defintley one of them. After seeing how fast he can run when you tell him that there are margaritas two tables over, I’m pretty sure your husband is the Olympic champion of the household. I don’t think his feet even touched the ground on his way over. My favorite part was the “shallow and inane-minded” part. First, how is it shallow? Assuming the picture was real, were you mowing down the pigeon because it wasn’t wearing this season’s outfit? And then “inane-minded” is just hilarious. This person has no idea what he/she is saying. This person is so stupid, I bet she has a membership to PETA. That is one of the funniest comments ever. Talk about living in a closet. definitely a member of peta. You sure know how to pull out some crazies. I’m surprised they didn’t mention in their comment that according to that “photograph” you also apparently have a GINORMOUS head (probably why you must curl from a seated position). 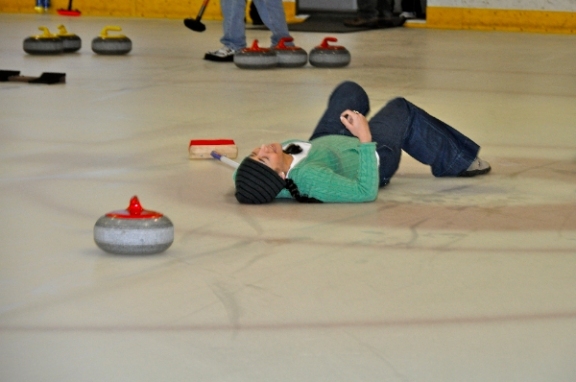 Maybe if that reader had a chance to see the video of you curling, they would have known that had there been an actual pigeon on the ice with you, that pigeon would have been in no danger whatsoever, and any actual photo of that pigeon would have shown him laughing with the rest of us at…ahem…with you. Down here it’s the effing deer, which are everydamnwhere. There’s a continuing debate about whether the city should allow an urban deer hunt to thin the herd (I’m in favor, only I think machine guns should be allowed), and some deer-loving twit is quoted in today’s paper as saying the city should be a deer sanctuary. Dear deer lover: If you love nature that much, here’s hoping families of black bear, wolves and copperheads make your back porch a home. I’d also be in favor of an urban moron hunt. Bucdaddy: I worked for a community who had a deer problem, and at one time took it on with a controlled deer hunt, and the person in charge of the community would come out from the office at night to find small figurines of deer beheaded on his car left there by all the PETA people…it was hysterical if it wasn’t so sad! I watched the video and have this observation: You sure were scratching a lot during the interview. Does Neville ice rink have a lot of fleas? why a stun gun instead of a .45? I don’t know what the big deal is. Clearly the pigeon got away.